Homemade Gravlax Recipe: This delicious homemade fresh salmon gravlax recipe is cured in salt, sugar, pepper and fresh dill for an absolutely divine flavor. I remember the first time I had gravlax. I was 22 and back in school working for probably my favorite chef of all time, who taught me how to make gravlax. I did everything I could to get out of the restaurant industry because I couldn’t stand the co-workers, owners, long hours, you name it. When I went back to school, I finally worked for a chef that I loved and learned a ton from. One recipe I learned was this homemade gravlax. Sure, I had eaten gravlax plenty of times, after all who hasn’t seen lox and bagels on a breakfast menu, but never made it myself. Finally, I got the chance to make gravlax and, dude, it’s so easy and so delicious. Salmon gravlax is the simple process of curing the fish by completely covering it in salt, sugar, pepper and herbs. Yes, there are some additional ingredients you can throw in to the gravlax recipe, but this is pretty much the base standard. You mix everything together, lay half of it on plastic wrap, place the salmon skin side down and then cover it with the other half of the seasonings. Wrap up the salmon and let it sit for 48 hours. BOOM…a homemade gravlax. The last step is rinse off all the remaining seasonings very well. Then, you just slice and serve! I am always getting scolded about my handling of raw protein, like this homemade gravlax recipe. I put the gravlax on a cutting board then transfer it to a plastic bag for storage, but whatever it is I’m always getting that pointed finger. Thank goodness I have a Franke Chef Center now because I’m able to keep everything in one place from preparations to preparing. When I’m done, I just simply wash and rinse the accessories clean at my station. Making this gravlax recipe with the Chef Center was a breeze. 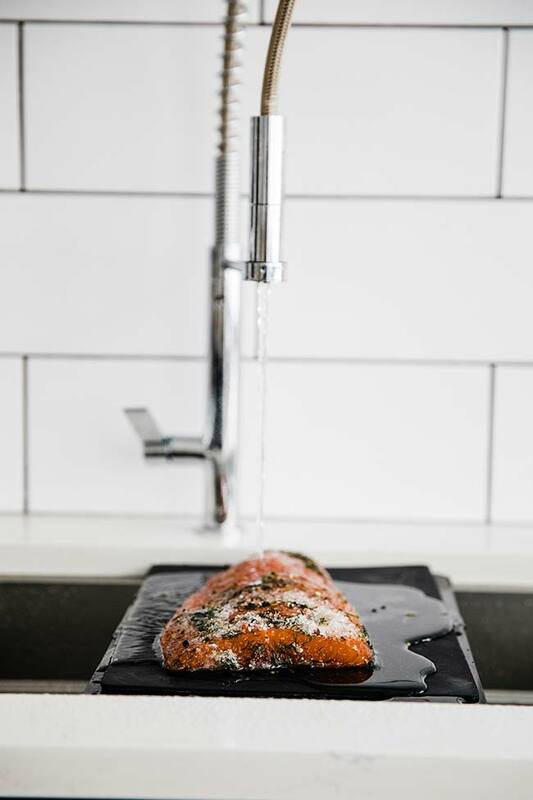 From rinsing the salmon, to covering it in the curing seasonings, to rinsing it again, everything is right there and as simple as can be. Serving gravlax is so pretty and there are so many accompaniments you can serve with it. I like to use an assortment of fresh breads, bagels and crackers alongside the gravlax. From there I like to add in some different types of whipped cream cheeses, fresh cheeses, fresh sliced vegetables and herbs that will make serving this gravlax that much better. The point of serving a homemade gravlax is to not only make sure it tastes delicious, but looks absolutely gorgeous. With the holidays in full effect, I’m not sure there is a more impressive (or easier to make) breakfast or brunch spread than this gravlax recipe. Wishing you the happiest of holidays and a delicious homemade gravlax brunch! Here’s a few of my favorite breakfast recipes if you happen to love this gravlax recipe! Don’t forget to pin these big beautiful pictures of salmon gravlax! A few more shots of this gravlax for you! delicious homemade fresh salmon gravlax recipe that is cured in salt, sugar, pepper and fresh dill for an absolutely divine flavor. n a large bowl mix together the salt, sugar, peppercorns, dill and lemon zest until combined. Next, lay half of it down and spread it out to the size of the salmon side on a large sheet of plastic wrap. Next, place the salmon skin side down onto the seasoning mixture and then cover the salmon with the remaining half of the seasonings. Wrap the salmon completely with the plastic and place it in a pan. Let it cure in the refrigerator for 48 hours. Remove the plastic and rinse very well. Garnish with fresh dill leaves and slice thing and serve with assorted accompaniments.